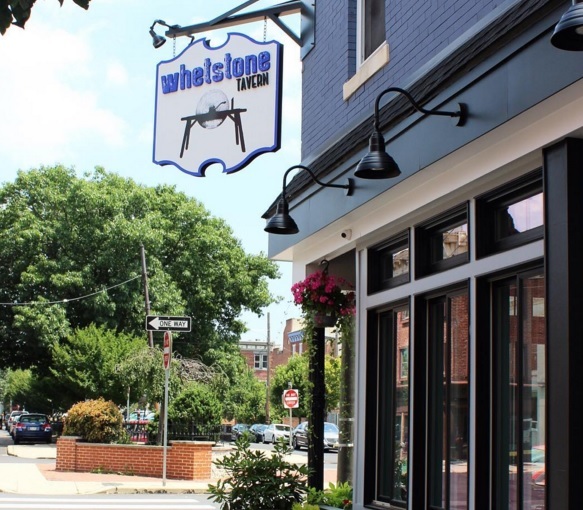 Whetstone Tavern opened in July at 5th & Bainbridge in an inviting corner spot that has seen its share of restaurants cycle through. We were fans of the last tenant, Tapestry, so we're happy to see another solid restaurant take its place. The layout is similar to Tapestry but with lighter, trendy blue/gray/white scheme that sets a chic yet comfortable mood. Executive Chef Jeremy Nolan's famed German cooking should be familiar to any Brauhaus Schmitz regulars. 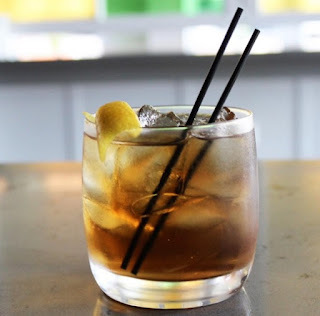 To Whetstone he now brings fresh, classy versions of American tavern fair and a bourbon/whiskey-focused drink menu. Our party of four was satisfied with our choices and really impressed with some. Two appetizers really stood out: the highlight of my meal was an outstanding pumpkin bisque added to the menu for fall. A topping of pumpkin seed pesto, pumpkin seed oil, sherry wine and crispy garlic perfected the simple, light creamy soup. 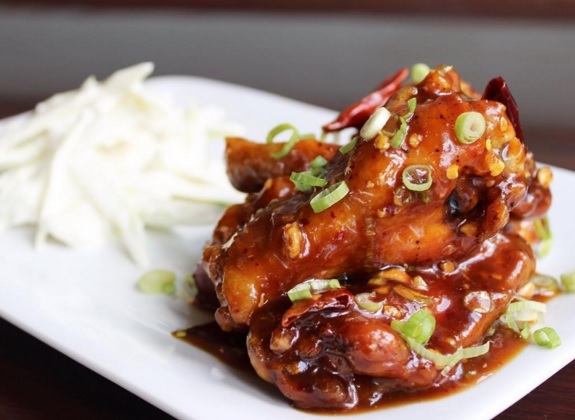 Kung Pao chicken wings. Warning: Seriously hot! The waitress warned that the kung pao chicken wings appetizer was quite hot and she was not kidding. Bradd loved their flavor and crisp, but wouldn't let my pansy tastebuds anywhere near the spice. Each entree was $24 and seemed to me an appropriate portion size and quality for the price. Braised rabbit and fresh pappardelle tetrazzini was an excellent choice for a cold night. It is served with sherry cream, beech mushrooms, smoked almonds and shaved piave cheese. 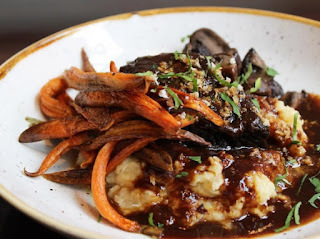 Another item that will catch your eye and not disappoint is the Creekstone Farms braised short ribs, served with roasted baby carrots and cremini mushrooms, parsnip puree, red wine gravy, fresh horseradish and parsley. The pan seared scallops with braised cauliflower, chile infused fennel confit and crispy fingerling potatoes were perfectly fine but probably the least memorable dish of the night. I was drawn to the pan sauteed lump and claw meat crabcakes, which turned out to be cooked just right and very tasty. I wasn't in love with the old bay roasted potatoes on the side but the leeks and pickled vegetable remoulade sauce made a deliciously seasonal topping. I just barely had room left for a bit of maple custard pie with walnut streusel on top. Thank goodness because it was awesome. 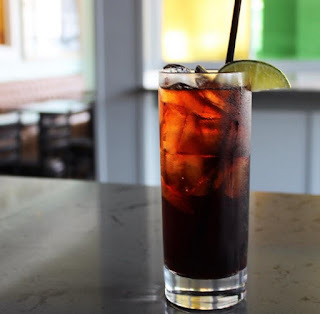 Whetstone touts its bourbon focus so for cocktails we tried the Burly Burch, which basically tastes like a (very) spiked root beer so get it if you're a big root beer fan, and the Apple Barrel, another strong, good drink with a bit of a bite. I'd go back to Whetstone Tavern for dinner any time, but would also enjoy just sitting at the bar for a few more cocktails and enjoying the atmosphere. And maybe another slice of maple custard pie. *Kid-friendly? Like many restaurants, I could see Whetstone Tavern as an ok place to bring a baby or young child during the early dinner hours or brunch. As it fills up, the noise level rises but was never disruptive. Tables are close together but not so close you couldn't replace one seat with a highchair. All Photos Credit to Whetstone Tavern's Instagram.